I grew up hunting as a kid at the age of 7. My Dad would take me and my brother hunting almost every weekend whether it was rabbit, squirrel, dove, duck, goose or deer hunting. My dad taught me almost everything I know about these species and how to hunt them. But he never took me turkey hunting. 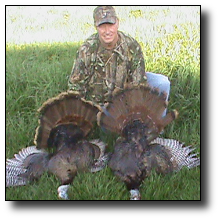 When I was about 18 I decided that I was going to learn how to turkey hunt but didn't have a clue as to what I was doing. I tried it a few times but didn't have any success so I gave up and didn't turkey hunt until last year. I started because my son said he wanted to learn. So, we bought the gear and books and videos. I reserved s piece of HSP property and then realized I didn't even have a call and had no idea how to use one. Back to the sports Department and I bought the only slate call they had. Back home and practiced. I could not keep any kind of tune at all, or so I thought. The next morning we set up. We sat there for about an hour and they began to gobble. I remember that I told my son, "Here they come, get ready, get your gun up". All the sudden here they came, walking right in front of us. I told him to go left and I would go right and to shoot on the count of three! I counted 1, 2, bang!!!!! Both turkeys hit the ground and didn't move. Needless to say, I was a proud papa that day. So here we are 4-20-10 and I finally convince my Dad to give turkey hunting a try. I have been planning this for about 3 months, making sure my Dad can and will go. My dad works a lot and his free time is minimal, so having this opportunity was a big deal to me. I call my Dad and told him, "OK, change of plans," we are going to a property that I have never been to before. I don't know where the birds will be but we will find them. As we got to the HSP property, he asked me if I knew where we were going to go. I don't know yet, we need to see where the toms are first. I pulled out an owl call and gave it a hoot. We heard four different toms reply. We walked about 300 yards and set up on the edge of a field. I put out 3 decoys and told Dad what tree to lean up against as I get myself into position. We sat there for about an hour. I was talking to two different toms that were making their way to us. Every gobble was getting louder and louder, so I look at Dad and tell him "OK get ready." They were coming from my left. Get your gun up and rest it on your knee. The one to my left was getting closer. I had my head turned to the left looking for him. I was on the call talking sweet nothings to this bird and then it happened, BOOM!!!!!!! It totally took me off guard because I was looking for this tom on my left when Dad shot. I looked out front and saw a turkey running to the right. I got so excited I pulled up my gun and shot 3 times! The damn bird was still running but I knew I hit him because feathers went everywhere! I shouted shoot the damn thing will ya? Then I hear BOOM!!! And the bird hit the ground. Two birds on the ground with an assist from Dad. This was awesome. This is defiantly a day that I will never forget. The day I took Dad turkey hunting for the first time and he has to help me take mine. So not only am I a proud Papa, I am a proud son for calling in my Dads first turkey. When it was all said and done, I asked him where the birds came from. He said "they have been out in front for about 5 minutes while you have been calling." I just thought you were letting them get closer, but I decided to shoot because I didn't want him to get away. I looked at him and just laughed and told him that I never did see them because I was looking to my left where I heard the one coming. So, the moral to this story is: Go out and hunt. One never knows what will happen. You may just be able to make someone smile and make a memory that will last forever.